^ Encyclopædia Britannica, 1911. 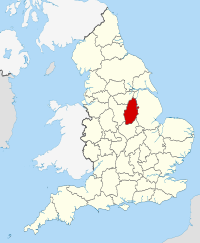 "Nottinghamshire, Geology". Retrieved 2005-12-11. ^ Met Office, 2000. Annual average rainfall for the United Kingdom Archived 2010年3月4日, at the Wayback Machine..
^ Met Office, 2000. Annual average temperature for the United Kingdom Archived 2010年3月4日, at the Wayback Machine..
^ Met Office, 2000. Annual average sunshine for the United Kingdom Archived 2010年3月4日, at the Wayback Machine..
^ Office for National Statistics, 2001. Regional Trends 26 ch:14.7 (PDF). Retrieved 2005-12-24. ^ East Midlands Observatory, 2005. Labour Market Statistics for October 2005. Retrieved 2005-12-24.